More and more people are rediscovering and adopting lifestyles in harmony with nature. The rediscovery of this way of life is not limited to gym-based fitness, spa visits or a healthy diet but also involves our living spaces and environments, and is called Home Wellness. The definition of Home Wellness is the idea of psycho-physical well-being that involves both the person and their entire environment. To bring the wellness lifestyle within the home, the cornerstone of this new way of living is choosing living arrangements and furnishings that help us to live better. Choosing a residence and the furnishings to go with it are of utmost importance: if the home's energy is in harmony with its inhabitants, they will feel that the home is a place where they are recharged with positive energy, and negative feelings and problems are �left at the door�. A house full of positive energy increases the well-being, safety and awareness of its inhabitants and thus helps them to overcome problems and weaknesses. In line with this philosophy, Cinius offers its products and solutions, not only to furnish homes, but also and above all to make every room in the home more comfortable, harmonious and livable for its inhabitants and give them well-being and a healthier and more energetic lifestyle. Alcuni Examples of Cinius products developed in line with the Home Wellness philosophy are our beds (Kyoto, Isola, Tatami, Maru, Arca, Luna, Yen etc) in a range of woods with fully interlocking joints or nuts and bolts made entirely in wood instead of metallic parts (Magnetic Free). Questi These beds are specially designed for those who are sensitive to magnetic fields: the absence of metal parts prevents the bed from turning into a receiving antenna which disturbs the sleep of those with this sensitivity. Ecology, well-being and quality have been the foundations of the Cinius philosophy for over 20 years. Because of this we only use selected raw materials (our wood comes predominantly from European forests, subject to reforestation programs) and processes with a low environmental impact (solid finger joint beech wood stained with non-toxic water-based varnish, interlocking assembly, artisanal techniques and products which can eventually be recycled), and aim for the perfect balance between aesthetic style and functionality. This is because Cinius products should be experienced with the body as well as the eyes, for a home environment characterized by harmony and well-being. 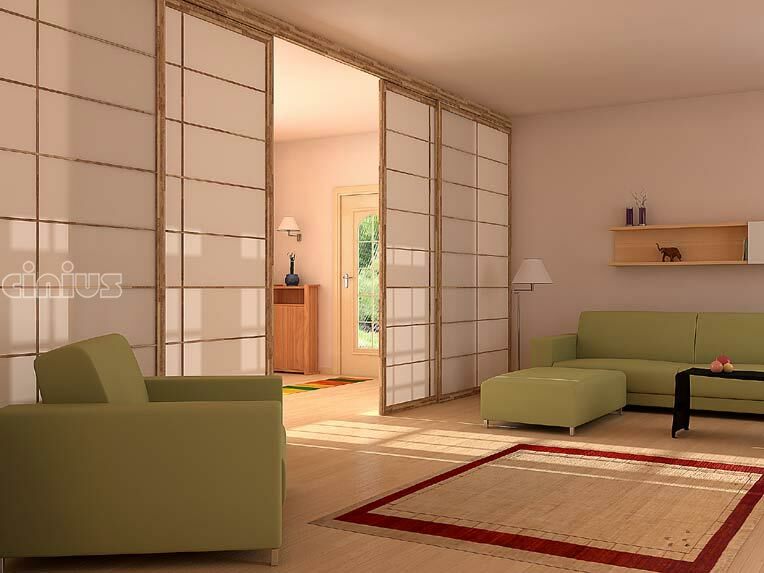 and allows the user to create a small Zen garden or other compositions..
Our versatile and functional sliding partitions, inspired by Japanese tradition, which can be used as room dividers or practical closet doors. Simple lines and attention to detail characterize our beds, sofas, bookcases, tables and home accessories, which draw their inspiration from traditional Japanese style. A tradition revisited in an totally modern key because our products have been designed for today's customers looking for, for example, proper rest on a bed without metal parts (and hence magnetic fields), complete with futon (filled exclusively with layers of whole cotton, from the first carding) or latex and cotton mattress. Even our sales organization is designed with the well-being and comfort of our customers in mind. So, to get closer to its customers, Cinius uses not only its branches in Bologna, Milan, Rome, Florence, Padua and Turin but also the large meeting place of the internet. By visiting our site you can see the entire Cinius catalog. "Two words with Fabio Fenili, a founding partner of CINIUS Ltd"
Cinius has a 360� view of the home, from more classic furnishings to the made to measure solutions which are our particular strength. 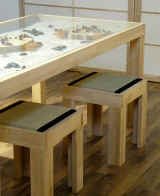 To explain a bit more clearly, we're talking about integrated furnishing systems which rationalize the use of space. The concept ranges from closets with made to measure sliding doors, to bookcases, to fixed and motorized lofts that allow you to get an extra room from the square meterage of your home, and which, for example, can be integrated with a wardrobe or the closet itself. In our philosophy, everything follows the forms of the house, pandering to it like a real carpentry job but with a contained cost. 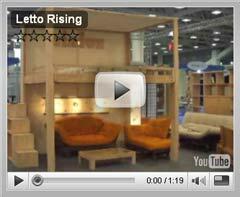 What does natural furnishing mean for you? It means giving homes and the people who live in them well-being in complete harmony with nature. More and more people are searching, including within themselves, for positive energies which give them a feeling of "shutting out� the negativity that surrounds us. So the use of selected raw materials, environmentally-friendly treatments, interlocking assembly using wooden screws and bolts or choosing futons lacking in springs allow us, for example, to avoid magnetic fields and live more healthily. These are just some of the small details which are fundamental for us, and which over time have a significant impact on our quality of life. 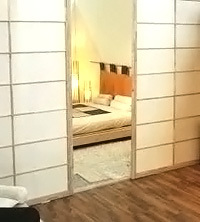 Japanese style is very popular right now in interior design and other fields too. What was the situation when you set up the company 25 years ago? Why this choice? We've always been fascinated by apparently distant worlds from which we can draw useful lessons. At the start of our adventure we were oriented towards ethnic and country style. This research soon led us to explore with growing curiosity Japan, whose aesthetic tradition is one of simple lines with precise, functional details; all characteristics very close to our conception of space. The idea was to blend the two cultures and create contemporary solutions that, yes, embrace Japan, but also highlight the traditionally high quality of Italian craftsmanship.